These smiles are too familiar. It is from my home country after all. The tricycle is a symbol of our country as the jeepney is. It has come a long way – from being a 5-seat passenger trike to a vehicle that can hold a battalion! Kidding aside, we don’t tolerate riding a tricycle this way but for posterity’s sake and for postcard’s sake, let my fellow Pinoys pose. The tricycle symbolizes also the simplicity of life especially in the rural areas. This postcard was sent by my good friend Stef of Lakwatserame. She knows so well how I miss home thus a postcard was sent. 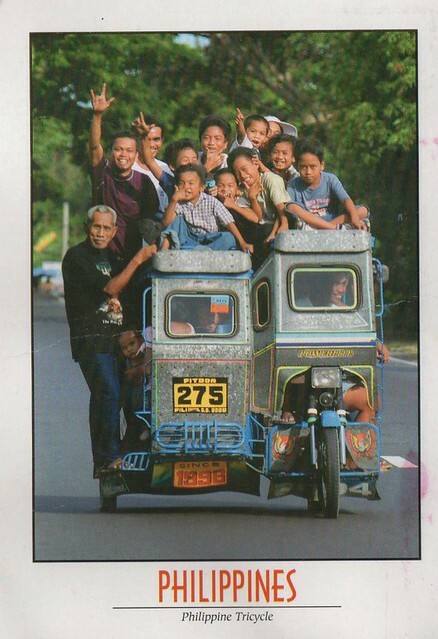 This postcard is a pleasant reminder of my roots, of how from a tricycle friends and I to school and around town.